Yesterday felt like a cookie day. 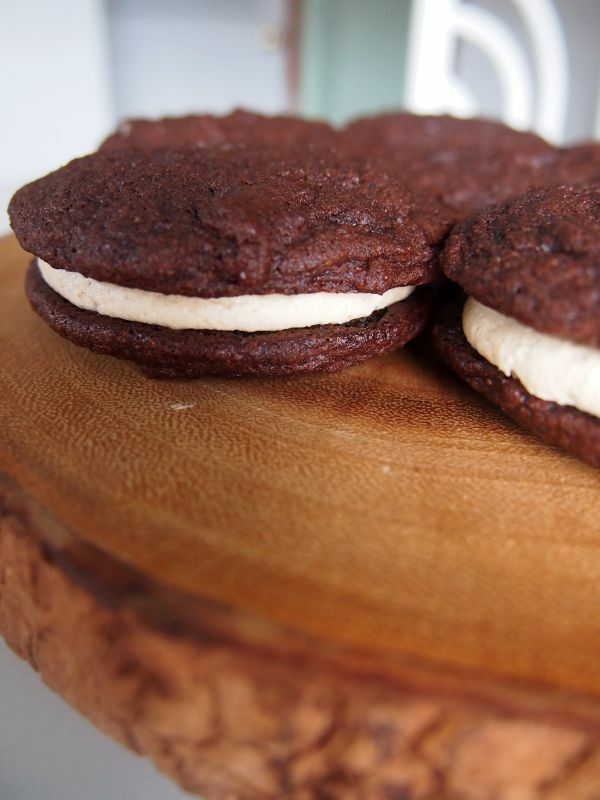 A chocolate sandwich cookie day. With the fluffiest of the fluffy peanut butter frosting in the middle. The level of salt in these things, and the soft chewiness and fluffy as hell filling is just so on point. Everything about these is perfect. Everything. I would not change a damn thing, except maybe I would like to be able to eat more than one and not feel like I’m dying. Know what I’m sayin? I think I’ve stated before that I’m not usually a fan of chocolate + peanut butter, but these are one exception. Because they are the embodiment of love. LOVE, YOU GUYS, LOVE! That’s how good they are. Want the recipe? Yeah you do. Preheat your lovely oven to a balmy 350F. Prepare some pans with silpats or parchment paper on them. Set aside. Whip the butter and sugars with the paddle attachment for a good 5 minutes. Add the eggs, and beat some more until it’s all combined. Add the cocoa first, carefully so you don’t make a giant cocoa explosion, then add the flour, salt, and baking soda. Mix on low speed just until it all comes together. I scooped the dough using a small scoop, but you can just eyeball it if you want. 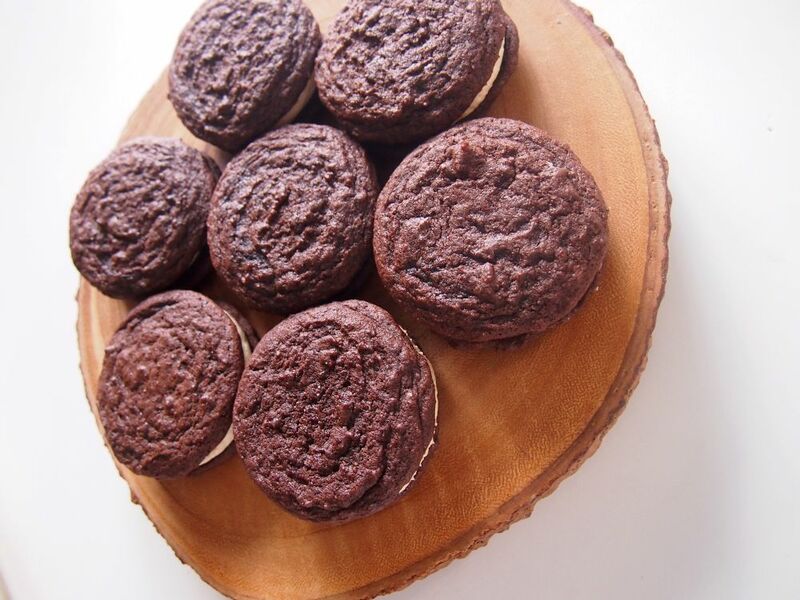 Bake them for 8 minutes, rotate, and bake 2 minutes more. They will seem underbaked, but trust me when I tell you to take them out. Allow them cool while you make the filling! Whip the butter and sugar until fluffy, adding the milk slowly. Mix in the peanut butter and whip whip whip until it’s the fluffiest thing you’ve ever seen. So good! I used a piping bag to pipe big blobs onto the cookies before sandwiching them, but you can just use a spoon if you want. Try not to eat too many, because you will feel deathly ill if you do. They are so good though! 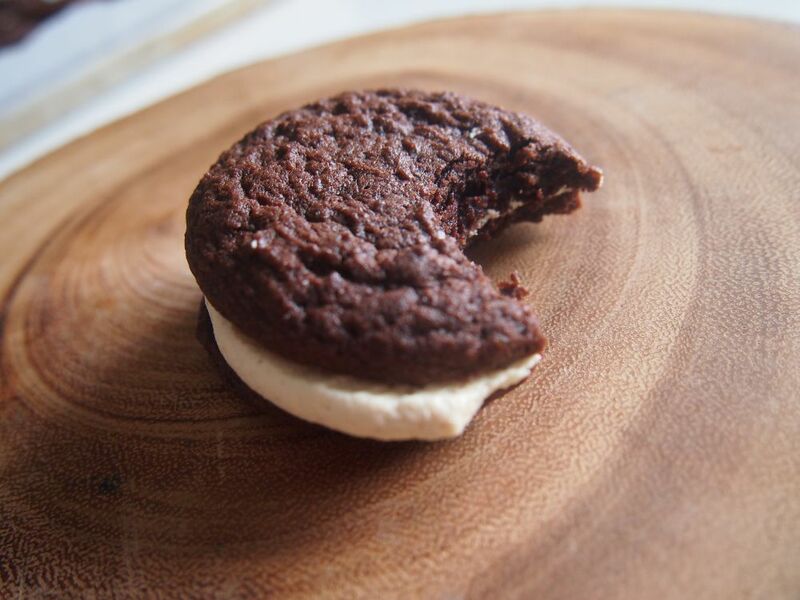 This entry was posted in Chocolate, Cookies, Delicious things I think are pretty delicious and tagged chocolate cookies, chocolate peanut butter sandwich cookies, peanut butter, peanut butter frosting, sandwich cookies, soft chocolate cookies. Bookmark the permalink.